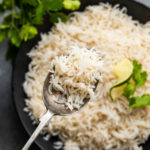 Coconut rice is a delicious vegan and gluten-free side, that compliments a wide range of entrees. 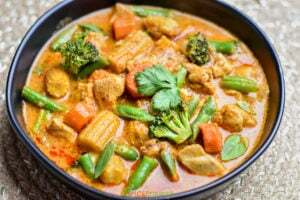 I prepare it by cooking rice in coconut milk, and season it lightly with salt. 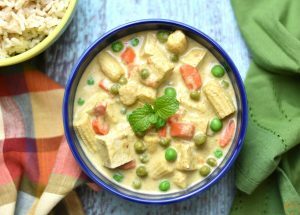 Coconut milk adds a creamy and naturally sweet flavor to the rice, which elevates everyday rice into an elegant and flavorful side dish. 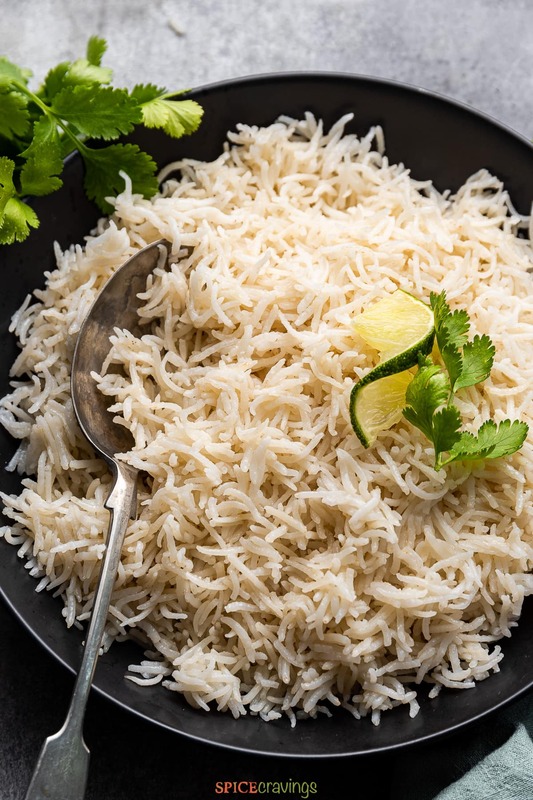 Coconut rice is a popular Indian food dish and also popular in Caribbean cuisine. 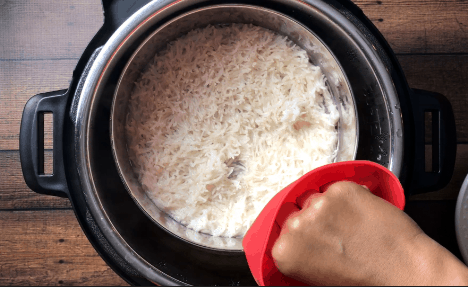 In this simple recipe for Instant Pot Coconut Rice, all I do is add all the ingredients to the pot and pressure cook the rice for 6 minutes. I also included instructions on how to cook in a stove-top sauce pan. that fits in my pot. I rinse the rice 2-3 times and if I have the time, soak it for 15-20 minutes. Then, I combine drained rice, coconut milk and salt in a container. Add water to the inner pot, place a trivet and place the rice container on top of that. I set a cook time for 6 minutes at high pressure, and when it’s done, I wait 10 minutes before manually releasing the pressure (NPR 10). I open the lid once the pin drops, and fluff the rice with a fork. That simple! 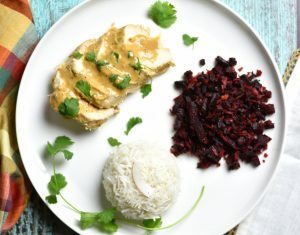 The pictures in this article are for coconut basmati rice. 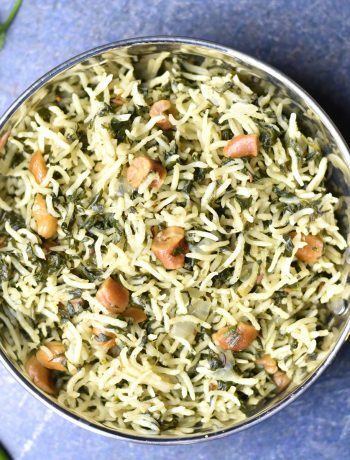 You can also make coconut jasmine rice with the same rice recipe. Coconut jasmine rice pairs particularly well with Thai dishes. Click here for more information on Pot-in-Pot cooking (PIP), and Sample Recipes. , until water runs clear, about 2-3 times. If you have the time, soak it for 20-30 minutes. Soaking makes the rice fluffy. on high heat. 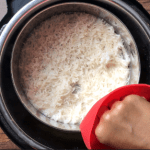 For 1 cup rice, add 1 cup water, 1 cup coconut milk, and salt and, bring the liquid to a boil. Add rinsed and drained rice, stir and reduce the heat to the medium-low. Cover the pot tightly with the lid and cook for 10 minutes. After 10 minutes, turn off the heat. Open the lid and using a fork, gently fluff the rice. Put the lid back on and let it rest for 5-10 minutes before serving. Coconut Rice is a flavorful vegan, gluten-free side that pairs well with many asian entrées. 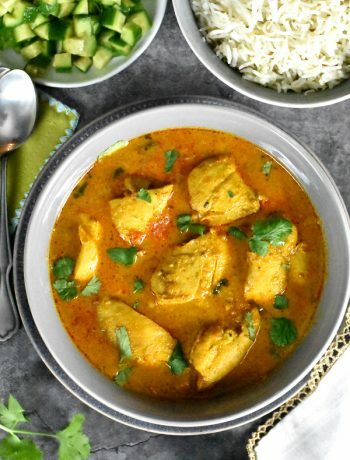 The rice is cooked in unsweetened coconut milk in the instant pot in this recipe. 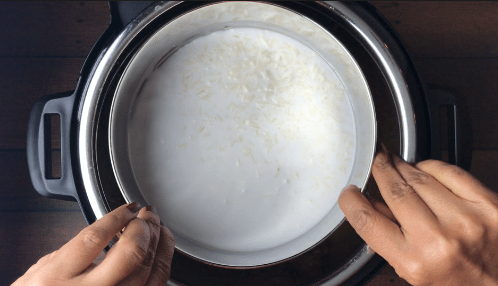 Cooking in the main pot: Add rinsed and drained rice to the pot, along with coconut milk and salt. Close the lid and turn the pressure knob to sealing position. Press Manual or Pressure Cook, for 6 minutes at high pressure. Wait 10 minutes before releasing the pressure manually (NPR 10), after which turn the knob to 'Venting' position. Open the lid after the pin drops. Using a fork, gently fluff the rice. 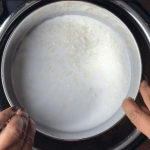 Cooking rice pot-in-pot (PIP): Combine rinsed and drained rice, coconut milk, and salt in an oven safe container. 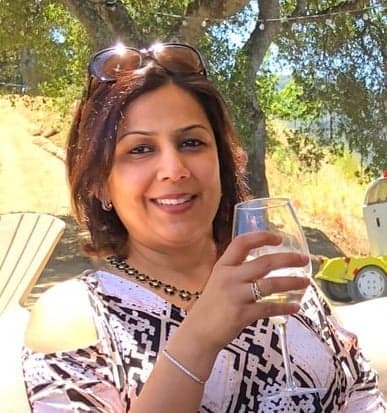 Pour 1 cup water in the inner pot of Instant Pot. Place a trivet and put the rice container on top of that. Close the lid. Valve set to sealing mode. Cook at Manual or Pressure Cook (High) for 6 minutes. Let the pressure release naturally for 10 minutes before opening the pot (NPR 10). Open lid. Fluff rice with a fork. Using the RICE Button: You can also cook rice using the RICE button, which defaults to cooking the rice at low pressure for 12 minutes. Follow the same NPR times and process. Rinse the rice in a mesh strainer, until water runs clear, about 2-3 times. If you have the time, soak it for 20-30 minutes. Soaking makes the rice fluffy. Place a Saucepan on high heat. For 1 cup rice, add 1 cup water, 1 cup coconut milk, and salt and, bring the liquid to a boil. Add rinsed and drained rice, stir and reduce the heat to the medium-low. Cover the pot tightly with the lid and cook for 10 minutes. Followed the pot-in-pot recipe precisely. My rice was no where close to done in the time written. Hi Christina, I’m sorry you had that experience. 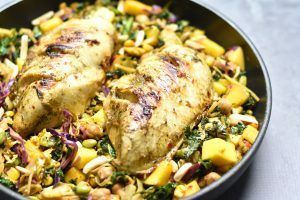 This recipe has been tested by me and many readers multiple times. I would think that either your pressure cooker didn’t come to pressure fully, or it didn’t seal well. If it doesn’t seal fully, the liquid keeps leaking and evaporating and the rice turns out under-cooked. I would say, please check your sealing ring and the pressure valve once. Hope this helps.